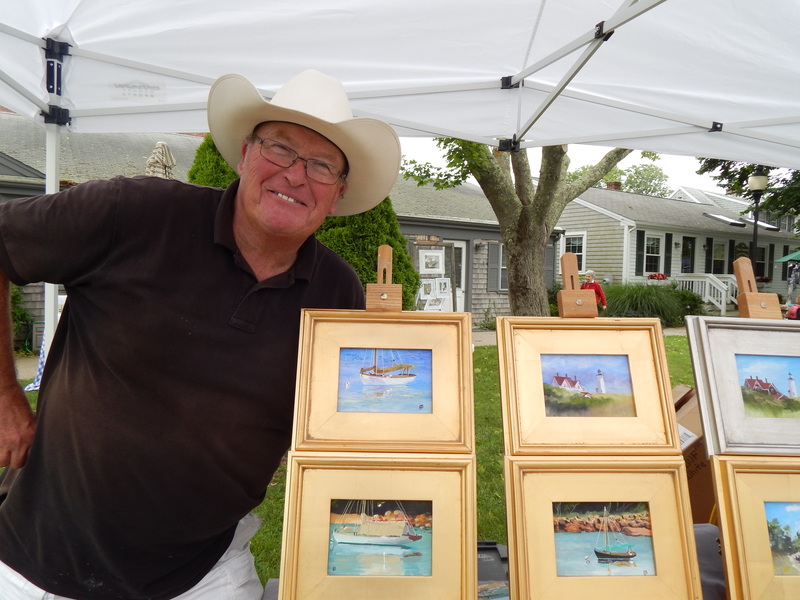 On Tuesday, July 10, the Falmouth Art Market will feature music by Glenway Fripp and by Jennifer Stratton and Gerry Mack, along with an array of fine art, crafts, and community information. The event takes place Town Hall Square, in front of Falmouth Town Hall on Main Street, from 2 PM until dusk every Tuesday afternoon through August 27. Inspired by the music of New Orleans where he grew up and Haiti, where he learned the rhythms of the drums, Glenway Fripp plays jazz standards and original compositions. He will perform from 3 to 5 PM. Cape Cod-based singer/songwriter/guitarist Jennifer Stratton will play from 5 to 7 PM. She performs blues-influenced original folk-rock music, as well as favorite covers. She has been writing and performing throughout the Cape and eastern Massachusetts for 20 years. While studying and working in Papua New Guinea, Israel, and Brazil, Stratton wrote and played songs about her experiences. In Brazil, she connected with local musicians to form a Latin fusion band that played both American and Brazilian music. Gerry Mack, also a singer/songwriter/guitarist, will join her. The Art Market hosts a wide variety of artists, including visual artists, potters, fiber artists, illustrators, photographers, print makers, glass blowers, jewelers, authors and poets, and more. Oil painter Forrest Pirovano is one of the regulars at the Art Market. Pirovano grew up in New Jersey and Ohio and discovered New England and the Cape while serving with the U.S. Navy. After graduating from the Art Institute of Pittsburgh, he and his wife settled in Marshfield, where he eventually owned his own advertising agency. Now living on the Cape, Pirovano enjoys the local architecture and its relationship to the countryside. His realistic oil paintings of Cape Cod scenes—the seaside, sailboats, cottages, and, his favorite subject, lighthouses—are a reflection of his love of the Cape environment. He invites the public to stop by his booth at the Art Fair to see his work and to watch him paint. He is happy to explain his painting process, choice of colors, and composition decisions. He sells original oils and limited edition prints, as well as notecards. For more information on the Falmouth Art Market, visit http://www.falmouthartmarket.com.